Adapted from Baking Illustrated, published by the Cook’s Illustrated Cookbook Collection. Granola bars have never really been a big thing for me. Sure, like most everybody on the planet I’ve eaten my fair share of them, but it’s pretty much been limited to occasions when I was traveling and everything else available at the airport kiosk or highway rest stop was out-of-the-question. For me, a granola bar is the thing to eat when I’m trying to be “good” or want to make sure I don’t end my journey with an MSG-induced headache or a stitch in my side; remove those concerns and you’ll find me wolfing down a Cinnabon or a bag of barbecue flavored corn nuts. 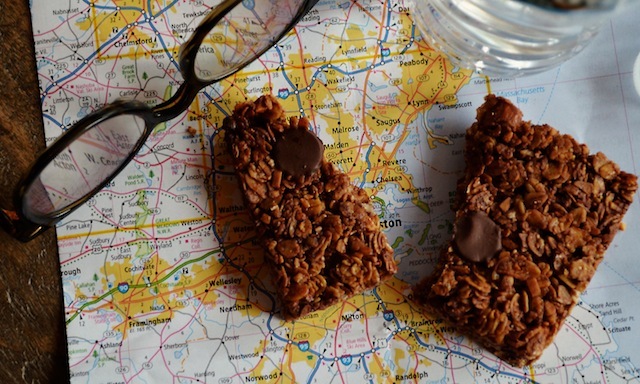 Still, when I was preparing for a short road trip up to the Cape recently and began to consider what I might whip up for the journey, it was the granola bar that came to mind. I suppose the impulse came from the same place that has me bypassing those peanut butter-filled pretzels at the gas station, but there was also something else at play—a hunch that what I’ve known as a granola bar hasn’t come close to capitalizing on the snack’s true potential. And so a challenge was born: to produce a granola bar that wasn’t just a (sort of) healthy between-meal alternative, but also one that I might get genuinely excited about eating. And so I started flipping through my cookbooks and combing the web in search of a path to something better, and where I landed was the recipe I bring to you here—or rather one fairly similar to the one I bring to you here, as I ultimately felt a few additions were in order. The original recipe comes from one of the cookbooks published by Cook’s Illustrated, (the volume titled Baking Illustrated), and appealed to me because it calls for first toasting the oats, something that promises to deepen the flavor of the finished product, and because it suggests mixing both chopped and finely ground nuts into the mixture (your choice of either almonds, pecans, or walnuts here)—an extra step that ensures a bit more textural interest than the norm. And rather than relying solely on honey or brown sugar to sweeten and bind the bars, CI suggests a combo of the two—a double header that imbues the snack with the best qualities of both (most notably the warm caramel flavor of cooked brown sugar), while safeguarding the finished bars against any potential sogginess (a common shortcoming when only using honey). What’s more, the recipe struck me as fairly simple and straight-ahead, which seemed only appropriate for something as simple and straight-ahead as a granola bar. In short there was plenty to like about the recipe, but also at least one big element that was missing—namely chocolate. 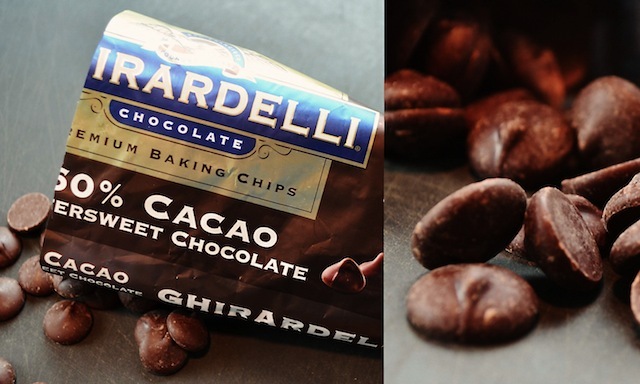 After all, if the goal was to create a snack that was genuinely satisfying, and not just the thing to grab when being guided by your conscience, then chocolate chips would have to receive a starring role. In other words, I followed the roadmap laid out by CI largely to its conclusion before handing the wheel over to instinct. My first detour involved adding a cup of bittersweet chocolate chips (60% cacao) to the oat/honey mixture—an addition I’d hoped would stud each bite of granola bar with little pockets of soft chocolate morsels, but that instead quickly melted into the mixture (the oats were still warm from the oven and the warmed honey), turning everything a light brown and distributing chocolate flavor throughout the mixture. Hmmmmm. I dipped my spoon in for a taste and liked what I found—distinctly chocolate-y, yet not overpowering. And I could still get the studded chocolate effect I was after later in the process. Okay, so maybe allowing the chocolate to melt at this point wasn’t such a bad thing; I decided to categorize it as a happy accident. In any case, once well combined it’s time to transfer the contents back into the foil lined baking sheet you used for the oats, making certain to press the mixture forcefully against the pan. This last tip is an important one, as a non-compacted mixture risks producing a bar that will fall apart when bitten. 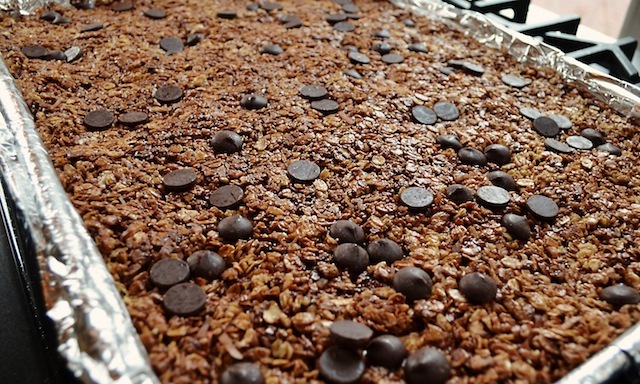 And, as mentioned earlier, once the granola mixture had been packed into the pan, I scattered a ½ cup more of the chocolate chips across the surface, using a spatula to press them into the soft batter (and this time they maintained their shape, even after forty-five minutes in a 300 degree oven). Of course, if chocolate isn’t your thing you can always skip this addition, or simply substitute raisins or dried cranberries. All of these options are good ones, though for what it’s worth having now made this with the chocolate I can’t imagine ever doing otherwise (and I include allowing that first cup to melt into the oat mixture here, as well). 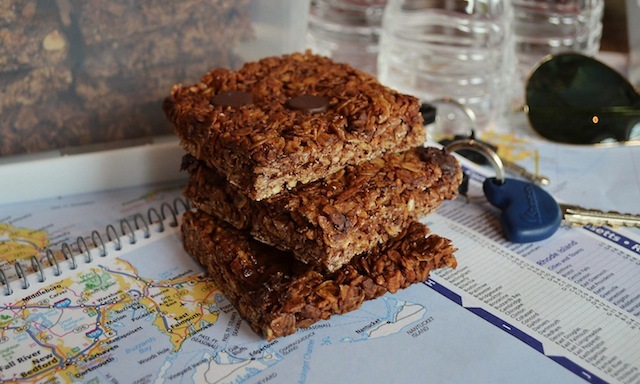 For me, those chocolate morsels proved to be one of the real pleasures of these granola bars, along with the bars’ subtle caramel flavor, and the grandmotherly, oatmeal-cookie fragrance that overtakes the kitchen during baking. 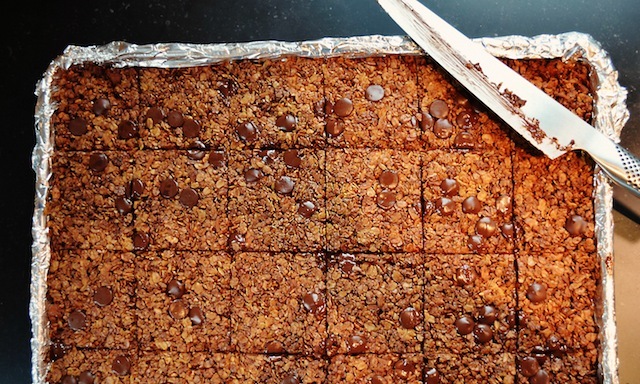 It’s a scent that makes it hard not to cut into the bars as soon as they exit the oven—something you’ll want to resist as the cooked oat/nut mixture, still in its baking sheet, needs ten minutes or so on a wire rack to firm up before being sliced. This firming up process happens quickly, though, so at the ten-minute mark be sure to have your chef’s knife at the ready, since waiting much longer could mean a baked mixture that’s too hard to slice. That would be a shame, since what’s held in the pan is something sweet, crunchy, a little healthy-tasting, and profoundly satisfying. In other words, no one gave corn nuts a second thought on that drive up to the Cape. —Adjust an oven rack to the middle position and heat the oven to 375 degrees. Line an 18” x 12” rimmed baking sheet with aluminum foil. 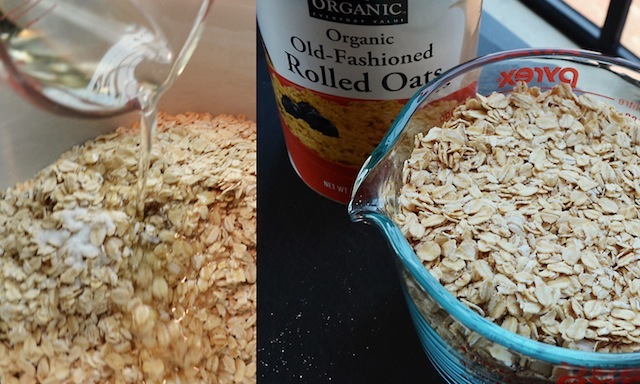 Combine the oats, oil, and salt in a large bowl and mix until the oats are evenly coated. Transfer the mixture to the baking sheet and spread into an even layer. (Save the mixing bowl for use later in the baking process.) Bake, stirring every 10 minutes, until pale gold, about 30 minutes. Remove the oats and lower the oven temperature to 300 degrees. —While the oats are baking, place the nuts in a food processor and pulse until coarsely chopped, about ten 1-second pulses. 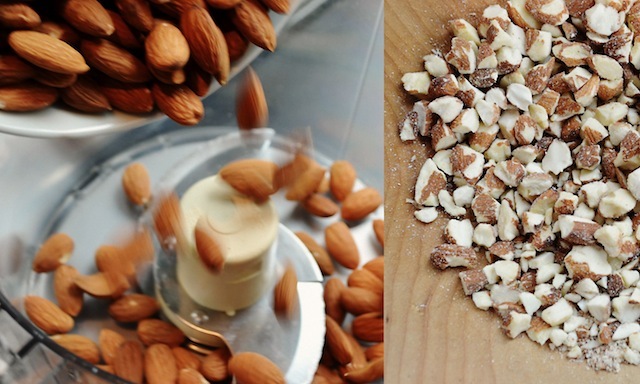 Place ¾ cup of the nuts in a small bowl and process the remaining nuts until finely ground, 20 to 30 seconds. Add the finely ground nuts to the bowl with the coarsely ground nuts and set aside. 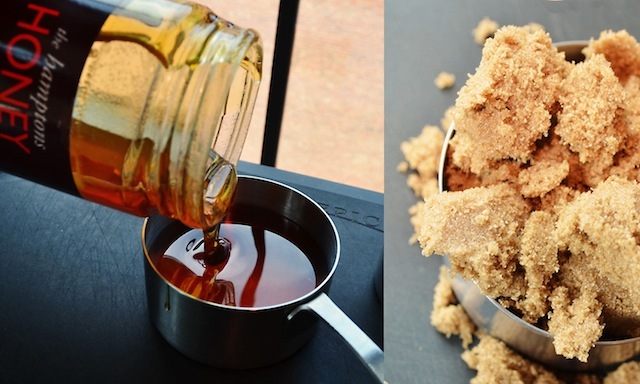 —Combine the honey and brown sugar in a small saucepan over medium heat and cook, stirring frequently, until the sugar is fully dissolved, about 5 minutes. 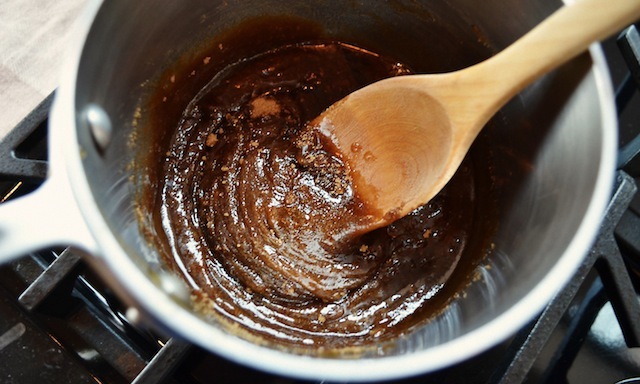 Stir in the vanilla and cinnamon (if using) and set aside. 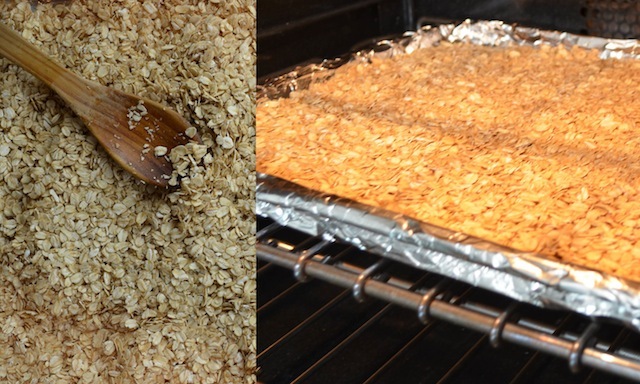 —Transfer the mixture to the same prepared baking sheet used to bake the oats and spread in an even layer. Wet the spatula with water and forcefully pack the mixture in a flat, tight, even layer. Scatter the remaining ½ cup of chocolate chips (if using) across the surface of the granola and press them into the oat/nut mixture. —Bake until golden, about 45 to 50 minutes. —Cool, in the baking sheet, on a wire rack for 10 minutes, then immediately cut into 2” x 3” bars using a chef’s knife. Remove the foil from each bar before serving. Cool completely before wrapping and storing. NOTE #1: The bars can be stored in the baking sheet, wrapped tightly in plastic wrap, or in an airtight container for up to 1 week. 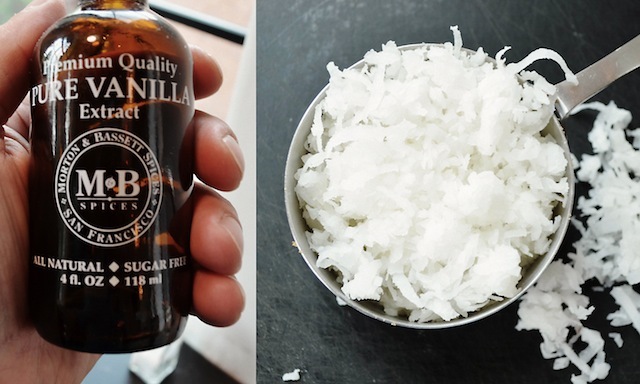 NOTE #2: Grated nutmeg and/or ginger can also be added to the cinnamon. If skinny is not a priority, dip it in chocolate and go straight to heaven. Hi - Great idea and they look so good. We're heading up to the Cape as well this weekend, so I think I'll try them out for the trip. Thanks! I am not a big granola bar person, but these look amazing. I want to make them for my family. Thanks for the recipe!